Plumbing is one of the most crucial parts of our homes, but it is sadly one of the most neglected. As long as there is enough clean and hot water flowing from the taps, most of us forget about our pipes until something goes wrong. If you’re lucky, you might be able to detect that something’s amiss before it becomes a huge problem. If you’re not, you might very well be faced with a veritable emergency that not only damages your plumbing but also your home in general. That’s why you need to call in your local plumbers regularly to conduct plumbing maintenance and inspections. Not only will you able to catch small problems before they blow up into bigger, costlier ones, you will in fact be able to conserve water and save on your utility bill with well-maintained plumbing. There are plenty of simple things you can do everyday to prevent premature damage to your pipes and drains. These include using strainers to prevent debris from going down the drain, keeping trash away from the toilet, and switching to enzyme-based cleaners instead of chemicals. But even if you do all of these things, it is still highly advisable to have a local plumber for seasonal plumbing maintenance. This is the kind of job that is best left in the hands of professionals who have the necessary experience and knowledge to spot even the smallest problems and address them immediately. Hiring local plumbers for plumbing maintenance gives you the advantage of familiarity. They have a good knowledge of the plumbing structure in your area, which means they know where the most common trouble spots are. The advice and solutions they will offer are also more suitable to your suburb’s geography and weather, making them more long-lasting and cost-effective. Plumbing maintenance conducted by your local plumbers is also more affordable. They don’t need to travel far, so their business expenses are already cut down and can thus offer lower rates compared to other plumbers. And because they are aware of the most current rates for plumbing services, you know that you will get honest pricing. For all of your plumbing maintenance needs in the Central Coast suburb, don’t hesitate to call Wide Plumbing Services. 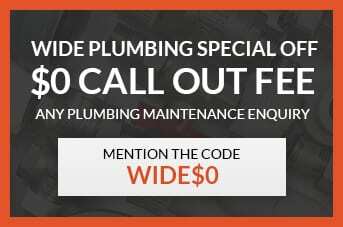 Simply call 0419 012 750 or email us at centralwideservices@gmail.com for any enquiries or to schedule an inspection of your plumbing. Rest assured that we will always deliver top-notch services at fair prices, each and every time. If you are hiring your local plumber expressly for the purpose of a thorough inspection of your plumbing, expect to shell out a call out fee. Should they recommend a small procedure or parts replacement on the spot, and provided that you agree, you may be charged a minimum fee or even receive it as a complementary service. On the other hand, if they are to perform various plumbing maintenance procedures then the price will range from $75 to $225 for a per-hour rate. The price can go up or down depending on the amount and the complexity of the work to be done, and if there are fewer or more parts that need to be replaced. If you regularly schedule a plumbing maintenance and inspection, you can expect more consistent prices; your local plumbers may even offer you a loyalty discount. Ensuring that you have continuous access to clean water is more than enough reason to have regular plumbing maintenance conducted. Call us at Wide Plumbing Services to schedule an inspection today! Our highly experienced and licensed plumbers will conduct a thorough examination of your entire plumbing system and give you an honest assessment on what needs to be done. No inch of your plumbing will remain unchecked, all the more to make sure that your pipes and drains are all in tip-top shape. Wide Plumbing Services also guarantees that we will perform our tasks with utmost professionalism. We respect you, your family, and your property; we will secure your permission first before accessing more personal spaces in your home and if we ever need to conduct additional work so that your plumbing is in good condition before we leave. Expect no less than stellar customer service whenever you call us — that is our promise!